THE PRODUCT HAS BEEN DISCONTINUED! The need for high security on sliding door cabinets and showcases, which secure jewelry, electronics, pharmaceuticals, and other highly valuable items is often overlooked. Choosing Mul-T-Lock’s Sliding Door Showcase Lock to protect these areas ensures superior mechanical security, ultimate key control, and the convenient ability to integrate this product into any Mul-T-Lock keyed or master keyed system. 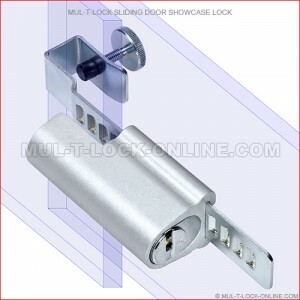 Sliding door showcase lock with affixing screw fits doors up to 8mm (5/16") in thickness. Sliding door showcase lock without affixing screw fits doors up to 7mm (9/32") in thickness (sits on bottom of showcase doors).